The Greek philosopher Diogenes said that when he died his body should be tossed over the city walls for beasts to scavenge. Why should he or anyone else care what became of his corpse? In The Work of the Dead, acclaimed cultural historian Thomas Laqueur examines why humanity has universally rejected Diogenes’s argument. No culture has been indifferent to mortal remains. Even in our supposedly disenchanted scientific age, the dead body still matters-for individuals, communities, and nations. A remarkably ambitious history, The Work of the Dead offers a compelling and richly detailed account of how and why the living have cared for the dead, from antiquity to the twentieth century.The book draws on a vast range of sources-from mortuary archaeology, medical tracts, letters, songs, poems, and novels to painting and landscapes in order to recover the work that the dead do for the living: making human communities that connect the past and the future. Laqueur shows how the churchyard became the dominant resting place of the dead during the Middle Ages and why the cemetery largely supplanted it during the modern period. He traces how and why since the nineteenth century we have come to gather the names of the dead on great lists and memorials and why being buried without a name has become so disturbing. 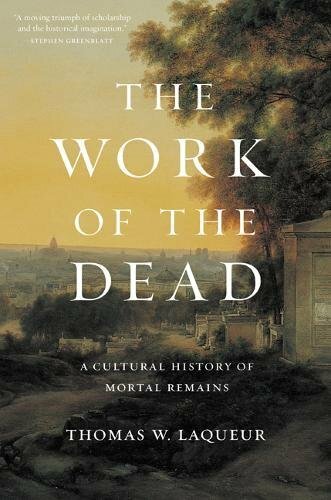 And finally, he tells how modern cremation, begun as a fantasy of stripping death of its history, ultimately failed-and how even the ashes of the victims of the Holocaust have been preserved in culture.A fascinating chronicle of how we shape the dead and are in turn shaped by them, this is a landmark work of cultural history.